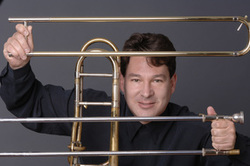 Scott Hartman is one of the preeminent trombonists of his generation, performing throughout the world as a soloist and chamber musician. Mr. Hartman is presently a member of the Yale Brass Trio, Proteus7, the Summit Brass, the Brass Band of Battle Creek and the trombone quartet - Four of a Kind. He began his chamber music career as a member of the famed Empire Brass. As a chamber musician, Scott has performed in all of the 50 United States. He has been a featured performer with many major United States symphony orchestras - including the Chicago Symphony, Boston Symphony, St Louis Symphony, Cincinnati Symphony, Atlanta Symphony, Philadelphia Symphony, El Paso Symphony, Dallas Symphony, Omaha Symphony, Providence Symphony, Detroit Symphony, San Francisco Symphony, Phoenix Symphony, Spartanburg Philharmonic, San Antonio Symphony, Rochester Philharmonic, Syracuse Symphony, Buffalo Philharmonic and the National Symphony and many more. Abroad, Mr. Hartman has been a soloist with the BBBC Orchestra, the New Japan Philharmonic, the Caracas Symphony, the Simone Bolivar Symphony, Bursa (Turkey) State Symphony Orchestra, the National Symphony of Taiwan, the Daejeon (South Korea) Philharmonic and the Korean Orchestra in Seoul, Korea.